Categories, an application that allows you to organize the applications on your SpringBoard into folders, was updated yesterday to version 2.29. This comes quickly after the previous update to version 2.28. The new version seems to be mostly bug fixes. The main fix was for a bug in which icons were duplicated and not removed off springboard. Below is the full change log for 2.29. I had no problem updating Categories on my iPhone though, I didn’t have any problems updating to version 2.28 either. You can get Categories via the BigBoss source. Categories, an application that allows you to organize the applications on your SpringBoard into folders, has been updated to version 2.8. The update makes quite a few back-end changes to the app. Check out the complete change log below. Note: We did have an issue updating Categories on one of our test iPhones. It took all the apps out of the folders and made the folders unable to be deleted. However, I updated Categories on my personal iPhone and I had no issues at all… it kept the folders and all the apps inside them. Yesterday, Categories, an application that allows you to organize the applications on your SpringBoard into folders, received a few updates. The update to version 2.27 was the major one which basically includes an internal rewrite of the app making the app perform much quicker. Updates 2.27.1 and 2.27.2 were basically bug fixes. See the complete change log below. After updating, I definitely notice an improvement in the app’s functionality. It is MUCH quicker and just feels less bulky. So far, I have not had one crash… which is great! Normally, Categories will crash a few times on me. I also love that when adding an application to a folder, the apps are now in correct Alphabetical order! It makes adding applications so much faster and easier! Overall, a great update… you will want to be sure to update to update this one. You can get Categories via the BigBoss source. 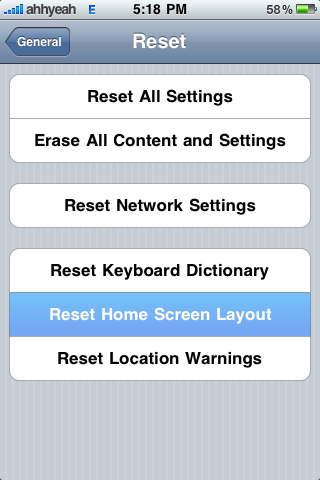 Yesterday, CategoriesSB was released in Cydia. 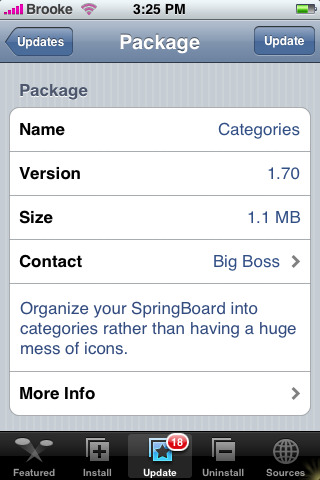 CategoriesSB is an application that integrates Categories into the SpringBoard. This is done by loading the folders you create using Categories directly on the SpringBoard instead of loading them as a separate app. What this basically does is allows the folders that you create with Categories to load much faster. 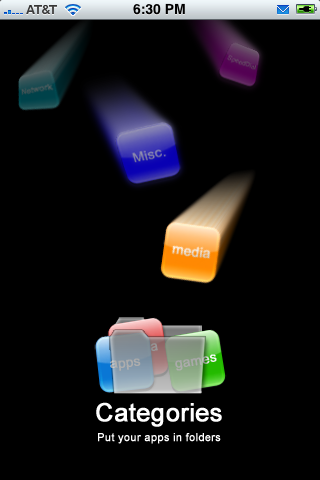 This also allows for things like badge support since the folder is directly on the SpringBoard. Version 1.72 of Categories does not have any visual changes but instead a bug fix. According to BigBoss, this is what was fixed, “fixes issue where camera and photos icon would be the default question mark icon when SummerBoard theme did not include camera or photo icons or the SummerBoard theme option was disabled in the Categories gui config.” So that is good! 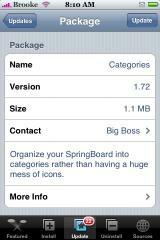 Categories is available through the BigBoss source. 1.1.3 + Customize + Categories = ?? ?